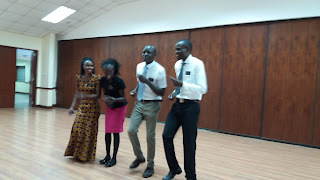 The Assistants (Elder Wafula and Elder Hales) planned a very nice get-together for Sunday afternoon. And wouldn't you know it, I left my camera at home. So sad. But LeRon took some pictures on his cell phone. 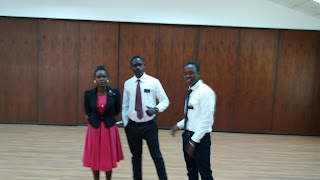 They are kind of blurry but will show a memory any way. 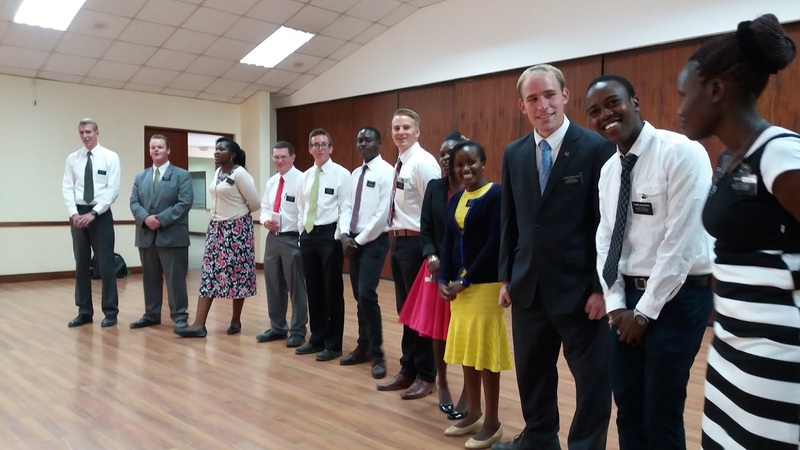 There are many languages represented by the missionaries, even those from Kenya. Kenyans generally speak three languages -- their tribal language, Swahili, and English. 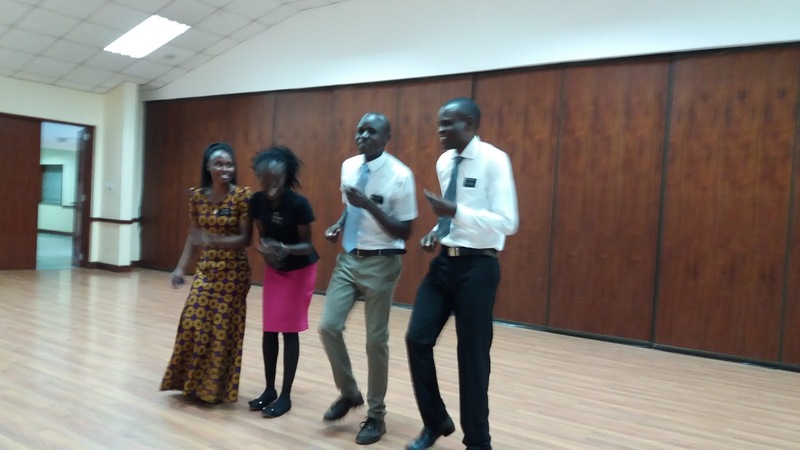 The missionaries were asked to sing a Christmas song in their native language. So here are the American missionaries -- acting like Texans!! 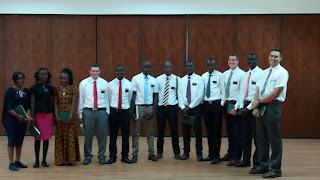 L-R (if I can tell from the blurry picture): Elder Pavik, Elder Barnard, Elder Ellis, Elder Egbert, Elder Christensen, Elder Manu, Elder McGrath, Elder Hales. 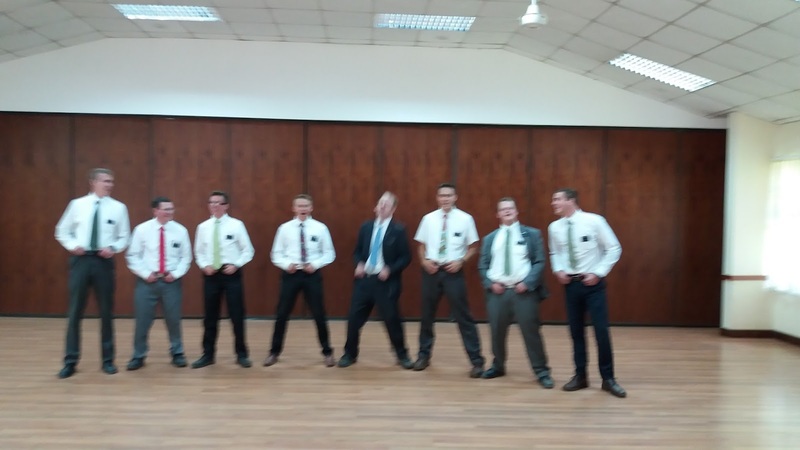 Some of the missionaries performing "The 12 Days of Christmas" or rather, "The 12 Days of Mission." They did a great job. "On the first day of mission, Msane gave to me "a companion that doesn't like me," "2 hours of study", etc. etc. So funny. Sister Gondwe and Elder Musonda's voices blended very well in singing a hymn in their native language, Zambian. I don't think it's called Zambian but anyway, they are both from Zambia. 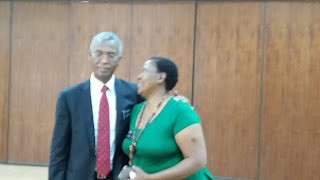 President and Sister Msane sang a song in Zulu. Zulu is an interesting language with lots of clicks. 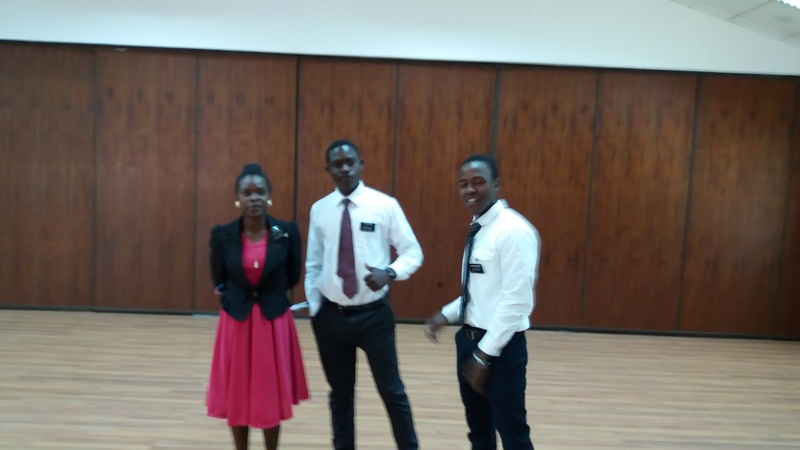 Elder Wafula on the right. I'll have to figure out who else the others are. They are singing in their tribal language. 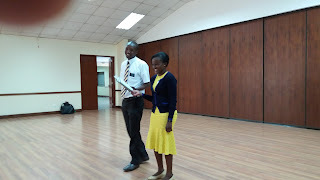 Elder Kyuvi and Sister Kiio singing in their tribal language. Another Christmas carol. Good job! Wish the pictures weren't so blurry. I'll get Elder Wafula to help me name everyone. 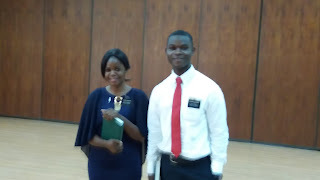 Elder Torrie and I sang a "Canadian" Christmas song, "Natividad." It was on the radio in Alberta for a couple of years and I really liked it. I've never heard it since. "In the fields, where the shepherds rested by night, Came a light that dazzled them for it was shining so bright. . . " No picture was taken of us. Natividad is one of my favorite Christmas songs. Too bad we don't hear it often! I like that the pictures show not just singing but movement during some of the native language songs. Here's a link to Natividad. Same version that we heard on the radio when we were kids. Somehow I missed this post. I'm glad you wrote the lyrics to the song, because I didn't recognize the title but definitely know the song!